Porsche LMP1 drivers Earl Bamber and Brendon Hartley thought their hopes of victory in the 24 Hours of Le Mans were over after spending an hour in the garage early on, only to fight back and claim a famous win at Circuit de la Sarthe. Racing alongside Timo Bernhard in the No. 2 Porsche 919 Hybrid, Bamber and Hartley dropped 18 laps behind the leader as the team’s mechanics spent more than an hour replacing the front axle on the car in the fourth hour of the race, making a fightback to victory unlikely. However, all five of the other LMP1 runners – including the No. 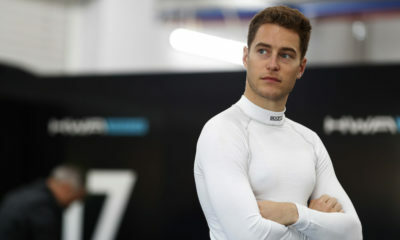 1 Porsche, which retired with a 13-lap lead, and the three rival Toyota TS050 Hybrids – faced mechanical issues during the race, allowing the No. 2 car to rise through the order and move into the lead with one hour to go en route to claiming Porsche’s 19th overall victory at Le Mans. “The car was running OK, and then all of a sudden during the braking zone, after the full course yellow, I felt something under braking like de-rating on the front motor,” Bamber explained after the race. “Then when I went back on power, something broke on the front axle. A whole load of smoke came in, so had to shut down the hybrid and we had to limp back to the pits. “So at that time in my mind, I really thought that it was maybe our race done and we’d maybe have to retire, but the guys cracked into it straight away. “It’s a true test to how quickly they could change everything and without the mechanics today, we definitely would be back up here. Then it was a tough, tough fight. “We were 18 laps down, so we had the goal to try and get back to the top five for the manufacturer points. “As more and more people fell away, it became a fight for the podium and then eventually the fight for the win. Hartley added that the team felt it had nothing to lose by pushing hard upon getting back out on-track, not knowing that the pace would lay the foundations for Porsche’s charge to victory. “The mechanics worked their backsides off. Their overalls were completely drenched, it was the hottest part of the day,” he said. “It was really tight. From the calculations we made, it was going to come down to the last lap. The pace that we predicted, we were looking at not passing all the LMP2s. “So from that point, the plan of attack was to push as hard as we could for the remaining 18 or 19 hours. The focus became that. “We quickly forgot about that maybe we’d missed the chance for victory, and we were completely focused on going as quickly as we could. While Bamber and Hartley had their doubts about continuing, Porsche LMP1 team principal Andreas Seidl always remained confident that the No. 2 car could be turned around and got back out to jump the LMP2 cars through the race. “We knew that if we could change the machine in one hour, we knew that we could still come out in front of the LMP2 cars for P5,” Seidl told Sportscar365. “Then as we know from our [No. 1] car, there is no guarantee that you finish. There is always a chance that you finish on the podium as long as you finish. “This is why Le Mans is so special. It’s the toughest race in the world. Whatever you do in terms of preparation, and we were really well prepared, you have no guarantee. Seidl confirmed that Porsche received no prior warning that the No. 1 Porsche was about to suffer a loss of oil pressure related to an engine issue, which ultimately left him with no choice but to retire the car. “We have to check at home what it was actually. The temperature went up and we had to stop the engine as a precaution on-track,” Seidl said. When asked about the high rate of attrition in the race, Seidl said: “I think it simply shows that we push each other to the limit and above. “We need to analyze it in more detail what the failure causes really were, because for example on our side, failures like this we’ve never had before, so we need to analyze it first. “I don’t think it’s down to the ambient conditions and so on. But we need to analyze it first.